The Anvil Jose Rizal Reader edited by Ani Habulan will be launched on July 2, 2010 (Saturday) at 4:30 pm at the Filipinas Heritage Library in Makati Avenue, Makati City. The book includes stories, essays, poetry, plays, and art from: Frances Alcarez, Christine Bellen, Susie Baclagon-Borrero, Jomar Bulda, Ian Rosales Casocot, Joel Chua, Adrian E. Cristobal, Randy S. David, Conrado de Quiros, Rommel Estanislao, Aaron Felizmenio, Jann Galino, Barbara C. Gonzalez, Ernest Hernandez, Patricia Laurel, Vivian N. Limpin, Mario I. Miclat, Ruben Nacion, Vim Nadera, Ambeth R. Ocampo, Elbert Or, Bryan Anthony C. Paraiso, Vicente L. Rafael, E. San Juan Jr., Randy Valiente, and Rene O. Villanueva. Alongside with this is the launch of Rizal: Makata by Virgilio Almario. 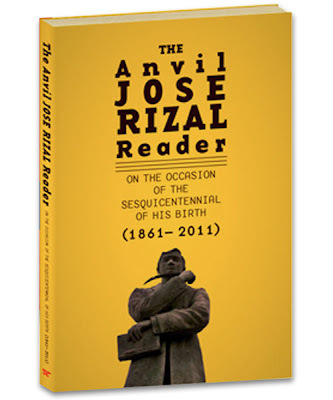 This event is a double book launch in celebration of Dr. Jose Rizal's 150th Birthday (June 19).